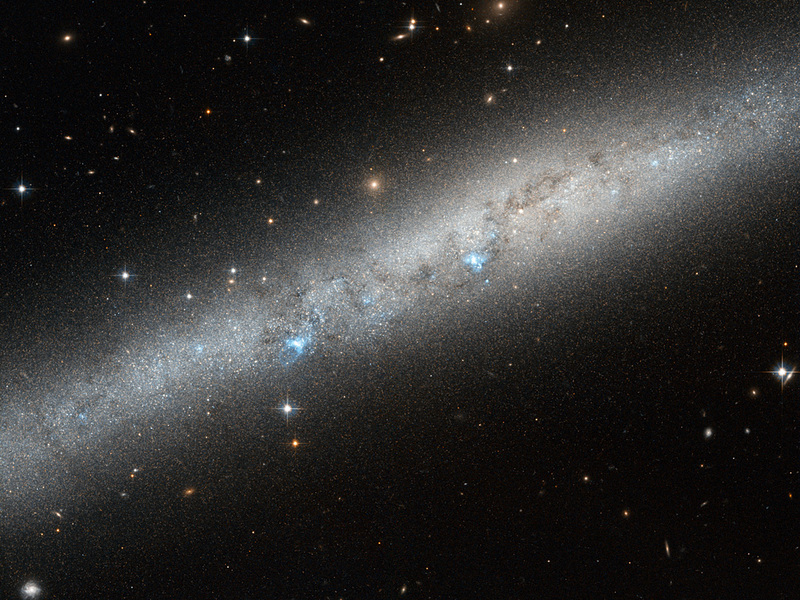 IC 5052 is an edge-on barred spiral galaxy that lies some 25 million light-years away from Earth in the southern constellation of Pavo (the Peacock), while it is receding from us at about 584 kilometers per second. It emits a bright blue-white glow which highlights its narrow, intricate structure. From our perspective, we are looking at the edge of the galaxy, so it is very difficult to see that IC 5052 is a barred spiral galaxy and also fully understand its properties and how they are arranged. In barred spiral galaxies, the spiral arms do not begin from the center point but are instead attached to either end of a straight “bar” of stars that cuts through the galaxy’s middle. Around two-thirds of all spiral galaxies have such bars, including the Milky Way. The interesting thing about this galaxy is that across the galaxy’s length bursts of pale blue light are visible, partially blocked out by weaving lanes of darker gas and dust. These are pockets of extremely hot newborn stars. The bars present in spiral galaxies like IC 5052 are thought to help these formation processes by effectively funneling material from the swirling arms inwards towards these hot stellar nurseries. This image shows part of IC 5052, surrounded by foreground stars in our own Milky Way galaxy, and distant galaxies beyond. The image is taken with the Advanced Camera for Surveys on the Hubble Space Telescope, using optical and infrared filters.